Pastor Daniel is excited, filled with big dreams, anticipating a bright future for him and his first church, Broadfield Community Church. Opposition and obstacles lie ahead, but amidst his trials and disasters, Daniel’s godly Uncle Eldon is able to offer wise and timely advice. 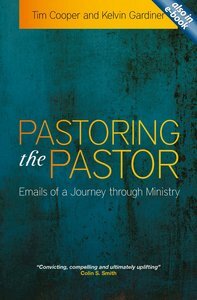 This carefully crafted collection of emails offers us a penetrating insight into the highs and lows of faithful pastoral ministry, helping the pastor and his people to grow in grace and love for one another. Senior Lecturer in the History of Christianity in the Department of Theology and Religion at the University of Otago, New Zealand. Kelvin Gardiner has pastored churches in New Zealand, the Philippines and the US. For ten years he led a ministry leadership organization overseeing one hundred US churches and providing pastoral support for overseas mission teams. He and his wife Jill currently offer pastoral care for mission agencies in Asia and Europe.